These incidents are from the latest survey by the B'Nai Brith. and calling him a “Jew boy”. at him and call him a “dirty Jew”. another Holocaust during a rally. door of a Jewish family is defaced. and kill you and your kids”. a Jewish behaviour of orthodox Jews. with “f**k Jews” and swastikas. the windows of a synagogue. her, “You Jews killed Jesus”. death threats, leading to her resignation. out to the 9/11 attacks. found at Mississauga’s City Hall. with tombstones overturned and defaced. home is defaced with slur “Jew ride”. swastikas and other antisemitic messaging. with the graffiti “Gas the Jews” and swastikas. at a group of visibly Jewish pedestrians. with the ugly slur “F**k the Jews”. Jewish, and verbally harasses her. swarmed by a group of teens and assaulted. her hair is set on fire. antisemitic graffiti and blue and red swastikas. synagogues to deliver messages of hate. An ominous pattern of economic espionage has cost American companies at least $13 billion in recent years as corporate spies sell everything from chemical secrets to military technology - with China being the most persistent perpetrator, according to federal authorities. "It's never been a more significant issue than it is right now,'' said Frank Figliuzzi, in charge of the FBI's Counterintelligence Division. Retired engineer David Wen-Chyu Liou, a naturalized U.S. citizen from China who worked for Dow Chemical Co. and lived for a time in Houston until he was convicted and sentenced to federal prison this year, was paid $600,000 for selling Dow's chemical secrets to two Chi-nese companies. "I'm not a Chinese spy," Liou, who is to start his sentence in June, told the Houston Chronicle. "I am just an ordinary retiree, but they turned me into some kind of international spy." While employed by Dow for 27 years, Liou worked on the intricacies of things like Styrofoam, Napalm and Ziploc baggies. After retiring, he developed a business as a consultant helping his native China revolutionize its method of manufacturing chlorinated polyethylene, CPE, a polymer used for automotive hoses, electric cable jackets and vinyl siding. But there was a problem: The world's best-selling brand of CPE, Tyrin, belonged to Dow. A Dow lawsuit against Liou and his business associates led to an FBI investigation, a federal indictment, a guilty verdict and a five-year prison sentence imposed in January. Our web page is now up for our upcoming film and panel discussion on China. This will take place on May 28th in Ottawa. Mark your calendars now. A Chinese writer who fled the country last year has alleged officials have detained a friend for seven months in the mistaken belief that he funded the escape. Liao Yiwu, now living in Germany, has issued an appeal urging writers and human rights campaigners to call for Li Bifeng's release. News of Li's detention comes amid growing concern for He Peirong, who said she had helped blind legal activist Chen Guangcheng escape house arrest last week, and Guo Yushan, another sympathiser. Both are thought to have been detained – highlighting the risks faced by those who support activists and dissidents. Liao slipped across the border into Vietnam last July after authorities had denied him permission to leave China 17 times. He said state security officers in south-western Sichuan province had detained Li two months later and that a court was likely to consider his case on 8 May, although prosecutors had twice rejected attempts to charge him with economic crimes. "The 'pretext' provided this time was too far-fetched even for the Communist party," he wrote. "I recently learned from several channels that the police arrested Li Bifeng because of me. The police suspect [he] financed my escape – this is a groundless lie." Li, who is also a poet and author, was jailed for five years for his involvement in the 1989 pro-democracy movement. In 1998, he was jailed for fraud over the sale of a safebox from his workplace, shortly after investigating a strike by textile workers and writing an open letter to authorities about his findings. Don't forget our upcoming film and panel discussion on China in Canada. NO holds barred - this will be one hard-hitting forum in Ottawa on May 28th. Set your calendars now! Concern is growing for relatives and supporters of Chen Guangcheng, the blind legal activist who fled from 19 months of house arrest in a Chinese village in Shandong province and is said to be sheltering inside the American embassy in Beijing. Police have detained four family members and two of those who aided his escape, a rights group said. The US has declined to comment on Chen's whereabouts, but friends have said that he is at the embassy, although he had told them he did not wish to seek asylum. His case threatens to overshadow the arrival of US secretary of state Hillary Clinton and treasury secretary Timothy Geithner for bilateral talks in Beijing this week. Chen, a self-taught legal activist, fell foul of authorities for exposing a mass campaign of forced sterilisations and abortions in his area. He was jailed for four years on what supporters said were trumped-up charges and put under house arrest following his release in September 2010. He and his wife have not even been able to meet neighbours or use the telephone or internet. At one stage their young daughter was prevented from going to school. In a video appeal to Chinese premier Wen Jiabao, released as news of his escape broke on Friday, Chen said that he feared "insane retribution" against his family, who remain in Dongshigu village, Linyi prefecture, in the eastern province of Shandong. The situation of his wife, mother and six-year-old daughter – who have also been living under house arrest – is unknown. But the Chinese Human Rights Defenders (CHRD) network said they believed four relatives were already in custody. Chen's older brother, Chen Guangfu, and nephew, Chen Kegui, were detained after guards broke into their home when they learned of the activist's escape. Chen Kegui said he used a knife to defend himself and his mother. Chen's cousin, Chen Guangcun, and his cousin's son, Chen Hua, were also taken into custody, CHRD added. Our event on China is on May 28th in Ottawa. Don't miss it. We'll have a film on China in Africa, followed by a panel discussion on China in Canada. The Chinese call it hei shehui or “black society” — a vast flourishing underworld of crime, corruption and greed that has become the most pervasive and dangerous side effect of China’s economic miracle. It is supposed to be secret, but it is everywhere. Officials have expensive foreign cars, endless banquets, foreign trips and generous rounds of drinks. Bureaucrats use their family connections and public influence to build private fortunes; public funds are diverted into stock and real estate speculation; farms and old apartments are illegally expropriated and resold to developers. Factories bribe officials to get supplies; truck drivers are constantly stopped for “safety inspections” that can be avoided with a “special fine;” police officers demand money for residency permits; railway ticket sellers need extra cash to find a seat on a train and farmers give bureaucrats packets filled with money during the Chinese New Year to make sure they get enough seeds to plant their next crop. 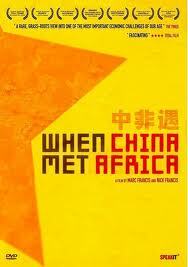 And, don't forget our upcoming film (When China Met Africa) and panel discussion (China in Canada) in Ottawa on May 28th. After the film, we will have a panel discussion on the implications of Chinese state-owned investments in Canada with award-winning journalist Terry Glavin, Human Rights campaigner David Kilgour, Terrorism and Security Specialist David Harris, University of Ottawa Professor Scott Simon, and Jason Loftus, deputy publisher for The Epoch Times Canada. Please join us for an evening of film, discussion, and food & drink! 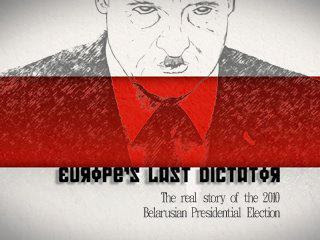 Don't miss "Europe's Last Dictator tonight in Ottawa - a film about the brutality of the Lukaschenko regime in Belarus. Admission $15 ($10 for students). Tickets available at the door. Irina is the sister of imprisoned Belarusian presidential candidate Andrei Sannikov. Through her eyes this doc charts the violent crackdown that followed the 2010 rigged elections and its dreadful aftermath. Powerful, award-winning photography captures Orwellian images of brute force used against unarmed men and women. We see the state-sponsored torture, murder and kidnap that defines Belarus today. A rare glimpse into Europe's most repressive state. "We formed a group to lead negotiations with the government, but the troops were called", Iryna Khalip, journalist and wife of presidential candidate Andrei Sannikov, says over the phone. "My husband was badly beaten, we're on the way to the hospital." Suddenly her voice becomes raised with panic. "Looks like we're being arrested. We're on the ground...They're hitting my face!" She screams and then the phone cuts out. This episode is part of Lukashenko's promise to "wring the necks" of all those who joined the opposition during the elections. Iryna Khalip and Andrei Sannikov were imprisoned after this arrest. Irina Bogdanova, Andrei's sister, has lived in England for 18 years. The other side of Europe, she has turned her house into a refugee camp for all those who have escaped Lukashenko's violent crackdown that night. A crackdown that it appears Lukashenko may have premeditated. Staggering images of the protest show riot police beating their shields in unison, and bloodied, disorientated protestors. "There was no resistance, people were not armed. It's just despicable what happened." Police charged the crowds with their batons striking the defenseless protestors repeatedly. "Human beings don't behave like that, animals don't behave like that", Irina says, her voice tremulous with emotion. Hundreds of others like Sannikov, including the other presidential candidate Alexander Neklayev, were also brutally beaten and imprisoned that night. With virtually the entire opposition behind bars, it fell to family members to campaign for their release. So Irina and Eva, the daugther of Alexander Neklayev, have now taken to the road to meet world leaders in an attempt to secure the release of their loved ones. While they lobby world politicians to put pressure on Belarus their relatives are brutally tortured. "If I think about how he is doing I just fall apart." In fact, as Lukashenko's popularity wains his violence against the opposition has increased. From Irina's defiant perpective this doc gets right inside the prison that Lukashenko has turned Belarus into, exposing the true extent of the crisis. "People are so isolated in terms of information in Belarus, especially now that 10 million people live in jail". As the opposition continues to languish in custody, how long will the people of Belarus have to wait before they are set free? Tickets available at the door or at the following retailers: Compact Music (190 Bank, 785 Bank), Collected Works (1242 Wellington) and Ottawa Festivals (47 William). On my way here, the glowing lights of Jerusalem were suddenly replaced by the sparks of fire which once consumed my people. This is us. This is our people, a people of illumination, an orphan people. This is us. Holocaust survivors, builders of resurgence, my brothers and sisters, tonight our tearing eyes turn to those who are not here with us, and our wide opened eyes gaze upon the yet to come. During the holidays I travelled all over the country. Blue skies, blooming fields, lovely children, hard-working people. I wondered about the communities they originated from which are no longer. For a moment, I replaced Tel Aviv with Vilna, Haifa with Bialystok, Degania, Nahalal, Beer-Sheva with Plonsk, Riga, Odessa. Not a single Jew remains there. The furnaces of the Nazi dictator and his emissaries brought calamity to the world and a holocaust onto my people. Holocaust deniers negate the deeds of their predecessors so as to cover their own crimes. The falsehood of negation will not extinguish the fire of the inferno. The piles of tortured bodies, the wounded thrown into the ditches of death, the furnaces burning the living. These are our witnesses for ever. The last breath of the infants in their mothers' arms will continue to horrify all human beings, until the end of time. I was born in Vishniev. Half of the townspeople came to Israel. The other half perished. After the war, I learned that on Sunday, August 30th, a dark dawn had come upon my hometown. The Nazis who had seized it ordered the Jews to pack their belongings and present themselves at their doorsteps. The SS officers passed by striking them and told them to proceed towards the synagogue. One of them cried out "Jews, save yourselves!" The Germans shot down those who tried to escape. The rest reached the synagogue which was made of wood. The doors were locked. All were burned alive. That was the last day of Rabbi Zvi Meltzer, my grandfather, my mentor. He was consumed by fire with his tallit on his head. That was the last Jewish day in Vishniev. Not even a single Jew remained alive. I visited Vishniev after the war. Not a Jewish mark remains. Not a house, not a synagogue, not a school, not a cemetery, only a heap of stones. As I stood there, the last Kol Nidrei prayer emitted by my grandfather's sweet voice rang in my ears. My lips murmured the Kadish. The Nazis created industries of death, assembly lines of murder, choking gas plants. No such thing has ever happened in history. So organized, so systematic, so inhumane. The Jews in Germany improved its culture, elevated its scientific level, enriched its economy , like all of Europe's' Jewry. Why did Hitler identify them as his greatest enemy? The answer is clear- the moral strength of the Jews was more dangerous to him than the military menace of his neighbors. The Nazis feared that the Jewish conviction that all men are born in the image of God would damage the fascist lie according to which there is a superior race. They feared the prophetic vision may dent the Nazi sword. I am proud to be an arch enemy to the Nazi evil. I am proud of our fathers' legacy being absolutely opposed to racism. I am proud of our belief that there is no one man superior to another man. I am certain that this is how our children and grandchildren will be brought up; as the Kadish is on their lips, "Love your neighbor as yourself" is in their hearts. My friends, a million and a half Israeli citizens are not Jewish. We are obligated to make sure that none of them are ever discriminated because of their nationality or religion. This is the essence of the existence of the State of Israel. Israel is a defense shield, a safe haven and a great spirit. Had the State of Israel existed during those days, I am convinced that things would have been different. We have paid a high price but we have not lost faith. The strengths of our nation are concealed in its history and contained in the souls of its sons. We used to be a question mark, now we are a strong country. Today humanity has no choice, we must learn from the lessons of the Holocaust and stand strong against existential threats before it is too late. There is no reason to undermine Israel's capacities to face this threat, whether visible or hidden. We have engendered a young generation with wide shoulders to carry the load. They are more than capable of leading Israel to its historic destiny following the Ten Commandments, Yavneh and its Sages, and Isaiah's prophecy. We will say Kadish in memory of our brothers, sisters, parents and children who were killed in martyrdom. And we will ensure our children remain Jewish, body and soul, as they carry the load of Israel's security and the peace of the Jewish Nation is on their shoulders. We came today to say Kadish in memory of our beloved ones who were killed in the Holocaust. We came to say and to swear "Never again". We came to say that we are a peaceful people who can defend itself. We can and we will. We have built and we shall build. We will always remember our 6 million brothers who perished in the Holocaust. In one week we will raise the flags of Israel's Independence which rose for the first time 64 years ago. Today, it is clear that the reality we have built is the vision we once dreamed. We will proudly wave the flags of the future of Israel, as an independent, moral, creative and contributing state. Let us wave the flags of peace, security and brotherhood. I did a 90 second blurb on the CBC for the Toronto Star.